So, it wasn't terribly hard to get instancing working with LTrees, at least the trunks. I basically used the instancing code I had before, but rather than passing it a Model object, I made it able to accept a VertexBuffer and IndexBuffer combo (which it would get anyway by extracting from the model). I haven't fiddled with the leaf clouds yet. I may not, I may move on to set tree models where I can fully control the level of detail, and have billboard imposters at low LOD. At any rate, it works pretty well. This is a 3x3 chunk of terrain (32x32x64 sized chunks), so this is drawing more than 9000 trees (simply set now to about 1 per cell), all at full detail and still managing ~ 30 fps. That's without any real optimization. 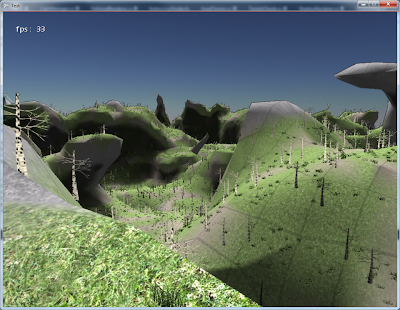 The shadows aren't working quite correctly with instanced item though. Dunno if I will worry about that for the time being.